In August 2012, the New Zealand Government signed a landmark preliminary agreement, recognising the ‘legal standing’ and ‘independent voice’ of a major river on NZ’s North Island (Whanganui River). Although the agreement is a significant achievement in itself, it also represents a noteworthy milestone in a broader movement towards the legal recognition of the rights of nature. 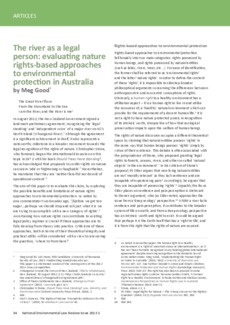 Christopher Stone, who famously began the international discussion on this topic in 1972 with his book Should Trees Have Standing?, has acknowledged that proposals to confer rights on nature can seem ‘odd or frightening or laughable’. Nevertheless, he maintains that they are ‘neither fanciful nor devoid of operational content’.